Best asset class valuation opportunities are in non-US large cap equities where weak economies and investor pessimism have depressed both equity prices and currencies. Non-US small cap equities are also very attractive, but to a lesser degree as they have held up better than large caps. 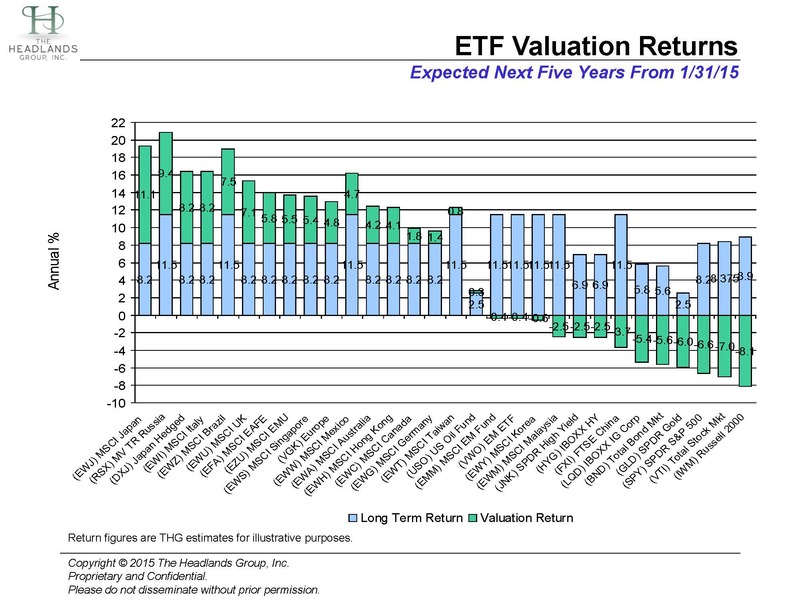 Emerging market equities are next most attractive at near fair value. The cap-weighted average masks the wide range of attractiveness of individual markets. Collapsing oil prices and choking economic sanctions have devastated Russian equities and the Ruble. Russia, Japan, Brazil, Italy and the UK are most attractive, while the US large and small cap, China and Malaysia pose the most risk from a valuation perspective. Note also that overvalued gold poses similar risks.